Ray Lane Bridge No 54 is a minor waterways place minor waterways place place on the waterways major waterways place village town city on the Lancaster Canal (Main Line) between Ribble Link - Lancaster Canal Junction (13 miles and 2½ furlongs to the south) and Lodge Hill Junction (Junction with Lancaster Canal - Glasson Dock Branch) (9 miles and 2¼ furlongs to the northwest). 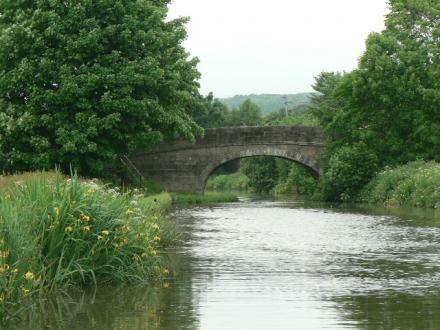 The nearest place in the direction of Ribble Link - Lancaster Canal Junction is Catterall Bridge No 53; 2¼ furlongs away. The nearest place in the direction of Lodge Hill Junction is Dobsons Bridge No 55; 2½ furlongs away. Kenlis Road, Garstang, PR3 1GD — 133 yards to the east. Catterall — 1220 yards to the southwest. 9 Garstang Road, Preston, PR3 1PE — 1598 yards to the northwest. Beaconsfield, Catterall, PR3 0 — 1507 yards to the southwest. Bowgreave Drive, Garstang, Preston, PR3 1YE — 1343 yards to the west. Claughton-on-Brock, Preston — 1440 yards to the south. Bowgreave Drive, Garstang, PR3 1YE — 1539 yards to the west. Preston — 1463 yards to the west. Garstang By Pass, Catterall, PR30HL — 1342 yards to the southwest. Unit 2, Garstang, PR3 1GD — 245 yards to the northeast. Ray Lane Business Park, Preston, PR3 1GD — 232 yards to the south. Preston — 1318 yards to the southwest. 11 Catterall Gates Lane, PR3 1YH — 1428 yards to the southwest. The Coal Yard Ray Lane, Barnacre, Preston, PR3 1GB — 36 yards to the northeast. Lancaster — 1544 yards to the southwest. Lancaster — 1402 yards to the southwest. 1 Joe Lane, Preston, PR3 0QD — 1600 yards to the southwest. Catterall., Preston — 1474 yards to the southwest. 7 Low Farm Close, Lindal-in-Furness, Lindal in Furness, Cumbria , LA12 0NZ — 1611 yards to the southwest. Lancaster — 1280 yards to the south. Preston, PR3 1TN — 1343 yards to the west. Unit 3b, Kenlis Road, Preston, PR3 1GD — 200 yards to the northeast. Catterall, Preston — 1474 yards to the southwest. Lancaster, PR3 1YP — 1614 yards to the southwest. Unit 5 Stubbins Lane, Claughton, PR3 0QH — 1068 yards to the south. Unit 3, Area A, Creamery Industrial Estate, Kenlis Road, Barnacre, Garstang, Garstang, PR3 1GD — 476 yards to the north. Catterall, Lancaster, PR31YH — 1474 yards to the southwest. 122 Garstang Road, Preston, PR3 1XN — 1381 yards to the southwest. Catterall Village Hall, Catterall, PR3 1XN — 1376 yards to the southwest. 40 Garstang Road Bowgreave, Garstang, PR3 1YE — 1365 yards to the west. Preston, PR3 1 — 1216 yards to the west. South Works, Kenlis road, Barnacre, Garstang, PR3 1GD, Preston — 178 yards to the northeast.